I am often amazed at the number of highly skilled CNC machinists and operators who can accomplish almost anything on a milling machine, but who are very uneasy and intimidated around a lathe because they don’t really understand the meaning of basic lathe terminology. That is the purpose of this article. I will try to clarify the meaning and benefit of a few of the “not-so-obvious” features that exist on a typical lathe spec sheet, and attempt to clarify their definition and explain why they might be an important consideration when purchasing a CNC lathe. Maximum Turning Diameter: this simply indicates the largest size of part that can be turned on the machine – using standard length tooling – without interference or collision with guarding or other machine components. With the X-axis retracted all the way positive, what size of part can be turned safely...as it relates to X-axis travels of the machine tool. For example: if you are looking at a machine with a max turning diameter of 16” inches, and the parts that you run on a regular basis are 15” inches in diameter or larger, then you would probably want to look at a machine with a larger maximum turning diameter. Even though, in our example above, the part would technically “fit” in this case, you must realize that you are running on the very edge of the envelope...and if you had to hang a tool out of the turret farther than normal – for one reason or another – you would likely NOT have enough X-axis travel to accommodate the part. Maximum Swing: refers to the largest diameter part that can be spun in the chuck without mechanical interference with guarding, cross-slide, or other machine components located near the chucking area. 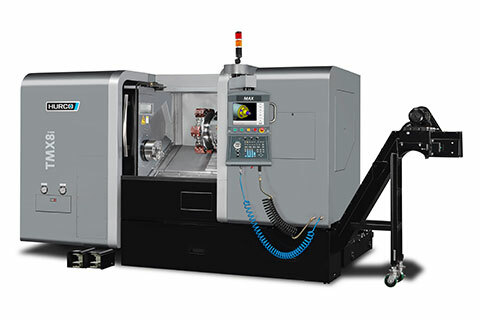 Depending on the style and design of the machine tool in question, this value could be larger than the maximum turning diameter mentioned above...however, this does NOT mean that you can turn a part larger than that specified in the maximum turning diameter specification. Horsepower & Torque: horsepower and torque are obvious considerations when purchasing a new machine, but their necessity may not be so obvious in all cases. If you are running work such as castings and forgings, drilling large diameter holes in steel, or generally turning features on large diameter parts, then horsepower and torque are going to very important to you...and you should be certain that the machine in question has enough for your application. However, if you are more focused on high production or general turning of small to medium sized parts, then spindle RPM may become more important than power in your case. Just as we have seen in the milling arena over the past several years, high-speed machining is quickly making its way into turning as well. As the technology of turning tooling is advancing, and through the tool coolant options are more prevalent, the principles of cutting shallower but faster are becoming more common...and spindle speed, rapid traverse, and maximum programmable feedrates become much more important than sheer horsepower and torque. Maximum Turning Length: very similar to the maximum turning diameter, this specification indicates the longest part that can be turned based on the mechanical limitations and axis travels of the machine tool. Keep in mind: the effective maximum turning length, for a particular part, can be less than specified by the use of larger or deeper chucks, or tooling that sticks out from the face of the turret farther than what is considered “normal”. In both cases you would be introducing the possibility for mechanical interferences – which would restrict the length of the part that could be machined, even though the physical travels and limits of the machine have not been changed.